With the IntAIRCOAT Newsletter, you will stay updated concerning worldwide innovations on aircraft and aerospace coating. "... I have attended the last 2 years quite some conferences but this was by far the most professionally organized one I have attended. I especially liked the ‘Meet the Speakers’ which gives the opportunity to discuss with more people! ..."
"... It was a very well run conference and provided a great opportunity to engage with members of the community on the relevant issues. ..."
As a very demanding application, aircraft coating faces many challenges. The coating has to resist extreme climate changes and mechanical wear. At the same time there is an increasing demand for special eﬀect coatings that can, for example, add fuel saving or anti-ice properties to the resistance of the surface layer. Another challenge is the application of the coatings. Innovative automation approaches are required here. The IntAIRCOAT conference covers these and more relevant topics regarding aircraft coating including environmental aspects, non-chromated primers and surface treatments as well as maskless painting. Airline representatives, suppliers and aerospace manufacturers come together to discuss recent innovations and future developments. 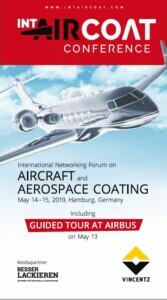 Join us, start networking at IntAIRCOAT – the international stage for aircraft coating!